Unfortunately for you, you’re wrong. Now is the perfect time to spend some of those travel funds. 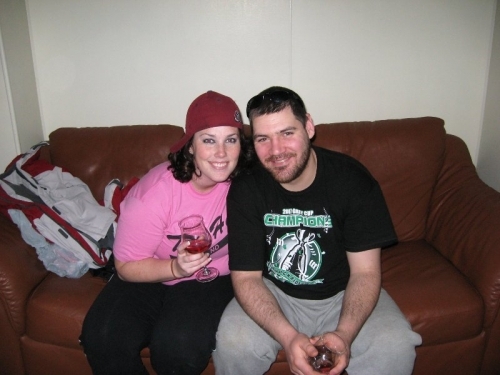 No, not because we really need a vacation, but because our friends Scott and Tamara, pictured below, are getting married. Congratulations guys! Being the good friends we are, we booked flights and hotels and are all set to meet up with them on their special day… plus a few days before. As the title of this post suggests, booking this trip allowed us to practice buying tickets the way we would for our actual trip. Well, maybe we won’t be booking return flights. And, maybe we would have more flexibility in our schedule on the big trip. Otherwise, it’s pretty much the same idea. Starting out, we knew that the wedding was on the 7th of June, a Tuesday. We also knew that Ashley was only entitled to 3 days vacation and, to make the most of it, we would want to leave sometime on the weekend before. 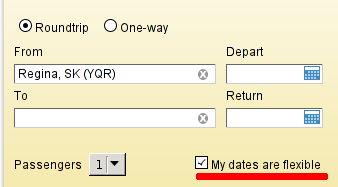 Selecting this option will allow you to quickly search different departure dates. When we first started into this, we were looking to leave on Sunday June 5th and return Wednesday June 8th. 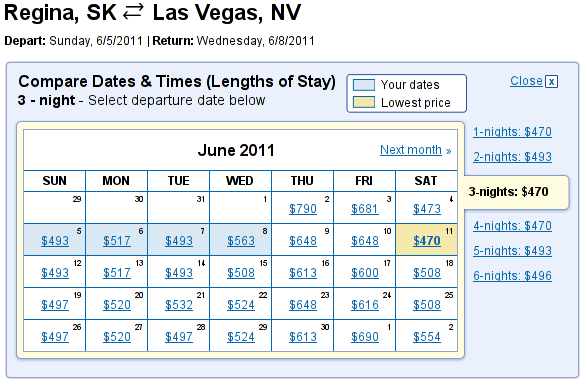 After a quick look at the price calendar, we discovered that we could save $40 ($20 each) by leaving 1 day earlier. That was enough to pay for our hotel room that night, effectively giving us a free extra day on our pre-RTW vacation. If we had more flexibility, we could have saved a bit more by travelling later in the week, or a bunch more by taking off a month prior. I don’t know about you, but I prefer to compare apples to apples. Sorting all flights by prices that include all fees and taxes sure beats the heck out the way most sites do it: hiding the extra fees until you click to book. I could find the same price on other websites, but I couldn’t find anything cheaper including the airline’s website. I like this map. It shows you how much flights cost from your location to anywhere else. 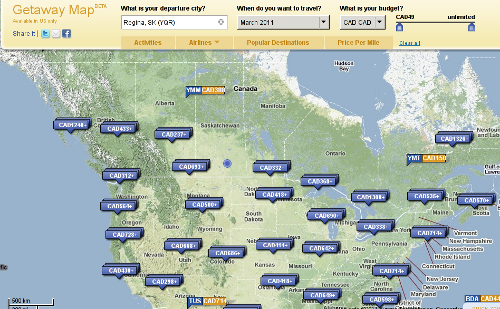 This is going to be a great tool for planning out several legs of a longer multi-city trip. You’re right, we didn’t use it to book this trip, but it is still cool. There’s always a catch. When you make your first search, FareCompare forces you to open up 3 additional browsers to view the same search on other travel sites like Oribtz and Expedia. No matter how you slice it, you are going to have 5 open browsers when you use this website. Not the end of the world, but certainly an annoyance. I assume this is how FareCompare makes its money, by advertising and referring you to the other major travel search engines. Fortunately I found this could be avoided. First, click the When-to-Fly link at the top of the page, then click the Search Flights link. Or, simply click here. I should point out that despite the long rave review above, we did not use farecompare.com to actually book our tickets. Once we found the cheapest flight on the day we wanted, we headed over to our VISA’s website to make the actual booking. Why? Because we earn points that can be redeemed to offset future travel at a rate of 4.5% when we book directly through the TD Travel Rewards website. Booking through FareCompare would only get us the standard rate of 1.5%. In case you are wondering, we are using the TD Travel VISA we told you about earlier in our banking post. This process went smoothly. We were able to find the same flight at the same price FareCompare had. We were even able to cash in $100 worth of points we had already saved reducing the cost of our booking. I’m glad we made this practice run now. At the end of the booking process there was a small note indicating that we would receive our booking confirmation with 48 hours. We didn’t have to wait that long, but we did wait a full 24 hours before we received the first bit of email correspondence. So there you have it, our flight finding/booking process. We’d love to hear any suggestions on how you find cheap flights. The cheaper we can find the better. P.S. Please don’t post way cheaper flight deals to Las Vegas from Regina. Our tickets are non-refundable, and it will make us feel bad. Thanks. Fare Compare is a good place to get started and I’ve used it before for our trip planning, along with Kayak. After I’ve got a ballpark figure on the flight costs, I then go directly to airline websites and see what they can offer me. Where you’ve got flexibility on your destinations (like you will on your RTW), it’s best just to go with the cheapest route! That’s resulted in us (probably) going via Sydney – Hawaii – Vancouver rather than directly from Melbourne – LAX. I’d take the first option every single time! Thanks for the advice. I’d much rather have the stop overs in Hawaii and Vancouver as well.